We’re incredibly excited for Nelson Mandela Day 2018. As part of the Cathedral Peak Challenge Series we have a Bonus Challenge to celebrate Nelson Mandela Day. 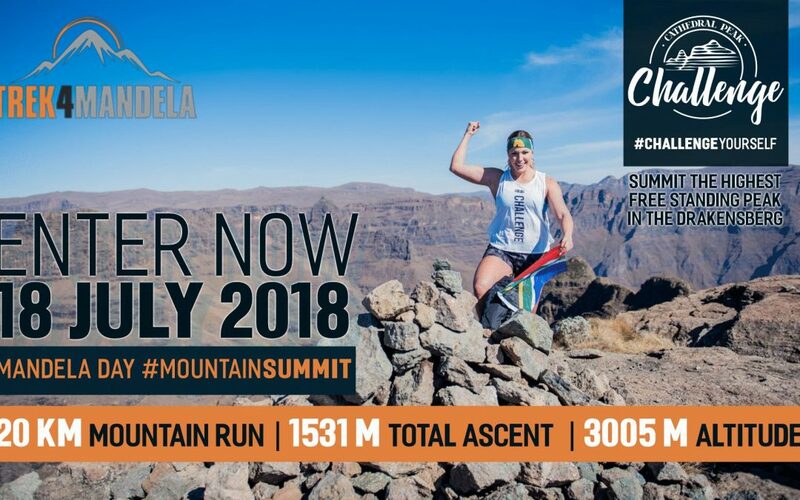 Nicole Capper (TammyTaylor Mrs South Africa 2018) is going to lead 67 people out, to climb to the top of Cathedral Peak (one of the Drakensberg’s most beautiful peaks) and back down again. As part of the Trek4Mandela campaign, there will be a group summiting Kilimanjaro on 18 July. We form part of the South African experience, as 67 people attempt to Summit Cathedral Peak on 18 July (this will be the largest number of people to summit Cathedral Peak on one day). The entire campaign is to raise money to buy sanitary towels for young girls who are unable to afford them. We’re asking each participant to donate R100 (if they can) towards the campaign. Safety is incredibly important on an experience like this. It’s not a gentle meander. You’ll be climbing one of South Africa’s highest peaks. We will have rescue marshals on the route at various intervals, and there are 3 rope sections on the summit. However, it is a wilderness environment, and fitness is critical. There is a safety video that must be watched, an indemnity form that must be signed, and there are rules for the Challenge that must be adhered to. However, if you’re fit, aren’t scared of heights, are looking for an experience of a lifetime, and to make a difference on Nelson Mandela Day, we’re looking forward to welcoming you as part of the Cathedral Peak Challenge – Nelson Mandela Day experience. Thank you for this amazing opportunity opened to all of us, i really can’t wait for the challenge and also to partake in change changing ones life. #LetsGo!!! I would love to be involve with any Nelson Mandela hike/s. If somebody could please email / contact me.. I do alot of hikes too.